The reason why some material becomes very expensive here on Earth, often has to do with the fact that the material is very rare. Take for instance diamond, although it is just a combination of carbon atoms, it is extremely difficult for nature to create it. It requires the right combination of material in a high density environment. But what if we changed the conditions here on Earth such that these demands are met. That is what is probably going on at a recent discovered planet, which probably consists for a large part of diamonds. Radio astronomers discovered a small neutron star about 4000 light-years away. A neutron star is what remains if a star with a mass of about 10 to 20 times that of the Sun dies in a supernova explosion. Neutron stars often rotate very rapidly around their own axis, while emitting strong radio waves. If the orientation of such a star is correct towards Earth, these radio waves reach us in small pulses like the light of a light house. When the pulses can be detected here on Earth, then the neutron star is called a pulsar. The astronomers discovered a small discrepancy in the rhythm of the pulses. Using computer models, they concluded that there must be a small object circling around the pulsar at a distance less than 2 times that of the Earth to the Moon. The diameter of the object must be less than half the diameter of Jupiter, about 60.000 km otherwise it would be ripped apart by the gravitational pull of the pulsar. Also, the pulses gave the astronomers an estimate of its mass. The combination of size and mass, give you a density estimate of the planet. It turned out that this density is comparable to that of diamond or platinum. Astronomers think that the object circling around the pulsar is not really a diamond planet. They think that it is the remains of a white dwarf. A white dwarf is basically the core of a star similar to our Sun, after it ejected all its outer layers while dying. This core can then consist of a dense mixture of carbon and oxygen. Due to the energetic radiation of the pulsar, the white dwarf lost even more mass, leaving only the densest part of the white dwarf's core. Here, the density is high enough to form diamond and platinum, creating a diamond-like planet. Advancing techniques make it possible for astronomers to discover more and more stars, not only at immense distances but also close to home, in the vicinity of our Solar System. The closest star to us, Proxima Centauri is about 4 light-years away from us. It is not within expectations that astronomers discover new stars closer, or only a few times further away than this star. However, recently astronomers managed to find brown dwarfs, or so-called 'failed' stars only a bit further away than Proxima Centauri. A brown dwarf is also known as a failed star, because technically speaking it is not a real star. According to the description of stars, an object has to be massive enough to start nuclear fusion in its core for it to be called a star. Brown dwarfs on the other hand, lack the amount of mass necessary for fusion to star. However, they are expected to have the same formation process as regular stars. Their mass is just much closer to that of Jupiter than to that of the Sun. Understanding brown dwarfs and their formation process is important to astronomers because it gives them a better idea on how stars form. Also, their atmospheres closely resemble that of Jupiter-like planets. The advantage of using brown dwarfs to study these atmospheres over Jupiter-like planets is that a brown dwarf is often found on its own, while a Jupiter-like planet always has a much brighter host star in its vicinity. 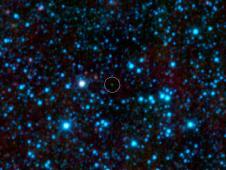 Using NASA's Wide-field Infrared Survey Explorer (WISE) astronomers discovered 100 new brown dwarfs. Within these 100, there were 6 that can be classified as Y dwarfs. These are of the coolest 'stars' known and they were found between 9 and 40 light-years away. One of these Y's had a surface temperature comparable to room temperature or about 25 degrees celsius, much cooler than ever found before. 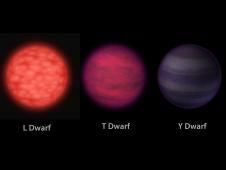 The previous observed brown dwarfs were more like oven-temperatures. Now, it appears as if astronomers moved out of the kitchen into cooler parts of the house. The closest brown dwarf was found 9 light-years away, but where astronomers don't expect to find a 'normal' star closer than Proxima Centauri, there is a good chance that a very cool brown dwarf will be. Is our Solar System special? In astronomy, accepting a theory that makes the Earth, our Solar System or our Milky Way a special place is usually treated with a great bunch of skepticism. There are billions of stars and galaxies in the universe, so for instance our Milky Way being somewhere in the center would be highly unlikely. Also, long ago people were convinced the Earth was in the center of the Solar System and I guess we all know what happened to the Earth's 'special status' there. However, now a team of astronomers claims that our Solar System may be a bit more special than what was thought. Our Solar System consists of a large variety of planets all moving around the Sun in near-circular orbits. So far astronomers have not discovered any system which is equally ordered as ours. Most systems show signs of tilted orbits, or even planets moving in an opposite direction than their host star. Astronomers have long wondered why there is such a big difference between our Solar System and many others, but recently new computer models reveal a potential source of chaos in other systems. Our Solar System is formed from a giant cloud, which collapsed. This resulted in a so-called protoplanetary disk in which clumping of material led to the formation of planets. Like almost any other star, also the Sun probably formed in a cluster of stars. In such a cluster, the chances of one protoplanetary disk colliding with another are quite high. When a collision takes place, one disk can gain a lot of mass, up to 30 times the mass of Jupiter. This increase can have very dramatic effect on the further evolution of planets in a disk. The computer simulations show that these collisions lead to planets with highly inclined orbits or even orbits in the opposite direction. Another possibility is that the lower mass Earth-like planets get kicked out of the system. These models suggest that the Solar System was probably quite lucky with its collisions. Since it formed in a cluster, it must have collided with other disks, but probably these collision were very gently. If this wouldn't have been the case, Earth would be kicked out of the Solar System and would be nothing more than a cold, lonely rock. A supernova explosion is one of the greatest explosions there is in the universe. Although they share the same name, not every supernova explosion has the same triggering mechanism. For one type of supernova explosions, known as the type Ia, the true origin was not even known. However, recently astronomers managed to pinpoint the potential progenitors of these explosions; a result with potentially large consequences. There is a consensus on a part of the origin of supernova type Ia explosions which is that it is the explosion of a white dwarf in a system with a close companion. A white dwarf is a small, compact object with about the size of the Earth and the mass of the Sun. Stars with masses between half that of the Sun up to about 8 times its mass, end their lives as a white dwarf. In the final stages of these stars' lives, they eject their outer layers, leaving nothing but their small, dense core. This is what is from then on known as a white dwarf. In order to produce a type Ia supernova, a white dwarf has to be in a system where it has a companion star in its close vicinity. This star is transferring mass to the white dwarf until eventually the white dwarf has accreted enough mass to explode as a type Ia supernova. However, on the origin of the companion star there was still a lot of debate. Astronomers were thinking that it was either another white dwarf or a 'normal' star like our Sun. Recent observations on 41 supernova explosions has revealed that the companion star in 35 of the cases had to be a 'normal' star. The astronomers looked for signs of sodium in the explosion. Since sodium can only be produced by a Sun-like star and not by a white dwarf, the companion star could not have been a white dwarf in these cases. Discovering the origin of a type Ia supernova is not only important in understanding supernova explosions, but also for the measurement of the acceleration of the universe. It appears as if all type Ia supernova are equally bright. Measuring the apparent brightness of such an explosion can therefore give you an estimate of the distance to the explosion. Using this mechanism astronomers discovered that the further away the explosion, the faster the object is moving away from us, hence the universe is expanding. If for some reason the mechanism behind each type Ia supernova is not always the same, as appears now (most of the times normal stars, sometimes perhaps white dwarfs) then the supernovae may not have been equally bright after all. This could have large consequences on the distance measurements and perhaps even the way astronomers think the universe is expanding. Does life have an extraterrestrial origin? For many years astronomers have been studying meteorites that crashed here on Earth. One of the key aspects has been to determine whether these meteorites contained the ingredients to form life. Many scientists tend to believe that life, or at least its building blocks, were brought to Earth by meteorites and did not form from the Earth's original elements. One problem scientists have to overcome when diving into this issue, is whether the ingredients are originally from the meteorite or just a contaminant from Earth. Recently, scientists finally managed to rule out the contaminant scenario. When a meteorite crashes into the Earth, elements that were originally in the Earth's soil could be pressed on to the meteorite. This could lead to the false information that the elements were originally on the meteorite while truly they are just a result of the crash. In order to overcome this problem scientists not only analyzed the meteorites but also the soil surrounding the place where the meteorites were found. The scientists analyzed 12 different meteorites for so-called nucleobases, the key ingredients for DNA. Not only did they discover these ingredients in the meteorites, they also found three very rare nucleobase analogs. These structures are structurally similar compounds to the nucleobases. These three very rare compounds were not found in the area surrounding the place where the meteorites were found, indicating that they are truly from outer space. This was not the only discovery indicating that life may have originated elsewhere. In a different study scientists discovered molecules in meteorites that are part of a very important cycle, known as the citric acid cycle. This cycle is believed to be a very important cycle in the formation of life here on Earth. The fact that meteorites contain these molecules is another indication for an extraterrestrial life source. This discovery leads to interesting questions like ' Did these key ingredients also get transferred elsewhere.' and 'Can alternative building blocks also be used to form life.' Unfortunately, these question can not be answered yet, but perhaps in the near future scientists are able to tell us more about the origin of life. Doesn't this title sound like a paradox. If you can observe a galaxy which is dark, then there has to be another not-yet-observed galaxy which has to be darker, otherwise it would have been discovered. However, this title does not concern the lack of starlight in this galaxy but the amount of mysterious dark matter surrounding it. It turns out that the galaxy, known as Segue 1, is basically just a clump of dark matter with a few stars inside. Segue 1 is a very small galaxy of only about 1.000 Sun-like stars. So the mass of every individual star closely resembles that of Sun. However, the total observed mass of the galaxy is about 600.000 times the mass of the Sun. It turns out, since most stars in the galaxy are a bit less massive than the Sun, that it has about 3.400 times more dark matter than 'normal' matter. In order to estimate the total mass of the galaxy, the astronomers studied the motion of the individual stars. If there would be hardly any dark matter present in Segue 1, then all stars would be moving at the same velocity. However, it turns out that some are moving much slower and some are moving much faster than others. In order to account for the differences in the velocities between the stars, the total mass of Segue 1 had to be about 600.000 times the mass of the Sun. Much more than the 1.000 stars in it could ever produce. Not only is this galaxy filled with dark matter, also the stars are some of the oldest found so far. The amount of heavy elements in the stars is extremely low, about 2.500 times as low as in the Sun. The amount of heavy elements is an indication of the age of a star. In the very early universe only hydrogen and helium were present and no stars have lived long enough to produce heavier elements. Over time more and more heavy elements were produced by stars and thereby made available as ingredients for new stars. This way, a star lacking heavy elements, indicates that it must have formed when there were not so many available, e.g. the early universe. Astronomers studied 7 stars in closer detail, of which 3 turned out to be extremely old. So far in our Milky Way only 30 of such stars have been discovered, so Segue 1 already has 10 percent of this. Thus Segue 1 is not only the darkest galaxy found so far, but also one with the oldest stars. Astronomers plan to look for small dwarf galaxies in the near future as well, since these host the most primitive stars. Segue 1 appears to have set a good example to follow. In the early days of the Solar System, just after the first planets were formed, the Earth started cleaning its orbit. Baby planets grow from 'eating' other rocky objects in their vicinity, until eventually they have eaten all that is around them. You may think that this information implies that we are all alone at our particular orbit around the Sun. Well, it turns out we are not. Recent observation reveal that the Earth is actually chasing a small asteroid while orbiting around the Sun. In an orbital system, like the Earth and the Sun, there are 5 positions where objects can have a stable, steady orbit. Here, the gravitational attraction of both the Sun and the Earth cancels each other out. These 5 points, as indicated in the image on the right, are often used as positions to put satellites in. L1 for instance, is used to make observations of the Sun. At this position, the Earth never shadows the Sun and since the position is stable, it is relatively easy to keep a satellite at this position. The small asteroid the Earth is chasing must be in one of these Lagrange points in order for the Earth to chase it and keep chasing it. The asteroid is actually located close to L4. Such small asteroids that remain more or less at the same distance from a planet in its orbit are known as Trojans. So far these Trojans have been found around other planets in our Solar System, but none around the Earth. It is very hard to observe the Earth's Trojans because they are often very small and they are most of the time dwelling in the daylight, as can be implied from the image. Using the WISE telescope astronomers managed to find the first Trojan in the Earth's orbit. WISE scanned the entire sky in infrared light for more than a year. Since the Sun is less bright in infrared it is easier to observe small asteroids while looking at infrared light. This way the astronomers found a Trojan, known as 2010 TK7. It is about 300 meters in diameter and is about 80 million kilometers from Earth. It is not exactly located at L4, but has a somewhat unusual orbit. Due to this orbit, it is not quite sure how long it will stay in this orbit, but astronomers think that the Earth won't stop chasing it for the next 10.000 years. Cosmological seniors not so old after all? According to the leading theories of galaxy evolution, galaxies grow larger and larger due to subsequent collisions. At some point a galaxy has cleared out its entire neighborhood, leaving no galaxies to collide with anymore. Often at this point, all the collisions gave the remaining galaxy an elliptical shape. Due to this formation scenario and the kind of stars that are found in an elliptical galaxy, astronomers believe these galaxies to be somewhere between 7 and 10 billion years old. However, new results may indicate that there are at least some elliptical galaxies much younger than that. One of the results of galaxy collisions is the fierce formation of new stars. However, after a while a galaxy runs out of full to form stars. The gas that is necessary to form new stars is either blown away from the galaxy or it has been used to form stars. At this point a galaxy can be seen as 'dead'. For a long time elliptical galaxies have been believed to be dead. First there was the lack of gas in the galaxies to indicate that no star formation is going on at the moment. Second, the population of stars in an elliptical galaxy is at least 7 billion years old. A few months ago, some results were already published disputing this idea. These results showed that there were new, young stars in some elliptical galaxies. Recently, new observations gave another explanation why elliptical galaxies may not be as old as always thought. These observations reveal two so-called tidal tails around two different elliptical galaxies known as NGC 680 and NGC 5557. These galaxies formed from a merger of two giant spiral galaxies. During such an event, material gets flung out of the system, leaving long filaments of gas around the galaxy, the tidal tails. These filaments are known to survive in this shape and brightness for only a few billion years. This implies that the two elliptical galaxies containing the filaments can not be older than a few billion years. This result refutes what is claimed by the leading theories of galaxy evolution. If any more of these young ellipticals are found, the theory has to be revisited with all its consequences.